Johnny Knoxville, Andy Samberg, and Shane Jacobson are on the shortlist to star in the upcoming Three Stooges. 20th Century Fox is still trying to cast its Three Stooges project. Rumor was the frontrunners included Benicio del Toro, Sean Penn, and Jim Carrey, but the latter two actors dropped out of the project. The most recent proposed cast puts Johnny Knoxville, Andy Samberg, and Shane Jacobson in the roles of the iconic trio. Knoxville is best known for his appearances in the Jackass television show and films, as well as his roles in the films The Dukes of Hazzard and The Ringer. Samberg is currently a cast member of both Saturday Night Live and The Lonely Island comedy troupe. Jacobson's filmography includes starring roles in Kenny and Charlie & Boots, as well as a gig co-hosting Top Gear Australia. Peter and Bobby Farrelly are directing the project from a script they co-wrote with Me, Myself & Irene's Mike Cerrone, and the keeper of the Stooges' estate will be on hand to executive produce. TheWrap reports that the project will have an unusual format, as "the plan is to divide the PG-rated film into three, 27-minute segments driven by physical comedy." 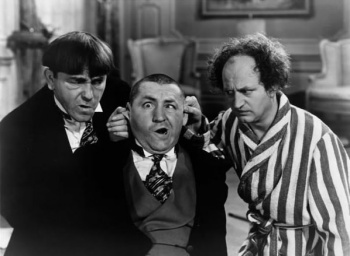 Whatever the final cast, Three Stooges is set to go into production on March 14, with a release date yet to be scheduled.